The Pasta Company has been a trusted supplier to the food service industry since 2001. We are dedicated to providing the industry with the best wholesale service – from supplying only the highest quality, all-natural products that are custom made to our client’s requirements, to promptly meeting delivery schedules and offering flexibility in ordering. We understand modern diners demand high quality, fresh ingredients – as well as healthy and nutritional cuisine that offers variety and value. Our customers keep coming back to us because we exceed their expectations, and those of their customers. Whatever your food service requirements, we’ve got them covered! The Pasta Company’s product lines include ready-meals, long and short pasta, pre-blanched pastas, portion controlled packs and frozen items, offering your establishment ease and brevity of preparation, concise yields, less wastage and consistency. 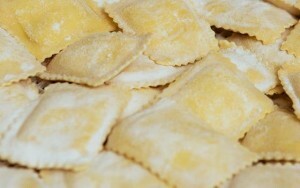 All our products are made daily to order, and all our filled pastas are made fresh then immediately snap frozen. We are also committed to the highest standards of hygiene and are a HACCP inspected facility. Create a signature pasta that reflects your unique establishment. If your hotel, restaurant, deli or catering company is seeking to create a unique or signature taste of its own, we can customise our pasta products to your individual food service needs. Over the years, we have introduced many innovative and niche products, and will work with our customers to create unique or traditional recipes to their individual specifications. If your chef has a taste sensation of their own down to perfection, you can even supply us with their special filling and we will custom fill a pasta of your choice. Contact us today on 3356 0313 to discuss your special needs or ideas for a unique signature pasta.